^ "Pakistan Shah Noorani shrine bomb kills 52". 12 November 2016. Retrieved 12 November 2016 – via www.bbc.com. ^ "Blast at Pakistan shrine kills 43, wounds scores". 12 November 2016. Retrieved 12 November 2016 – via Reuters. ^ admin2 (12 November 2016). 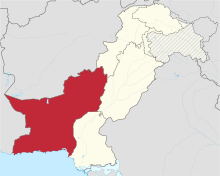 "Shrine of Sufi Saint Baba Shah Noorani bombed in Khuzdar killing 47 believers". Retrieved 12 November 2016. ^ "At least 45 dead, over 100 injured in Khuzdar's Shah Noorani shrine explosion - The Express Tribune". 12 November 2016. Retrieved 12 November 2016. ^ "At least 52 killed, 102 injured in blast at Khuzdar shrine". 12 November 2016. Retrieved 12 November 2016. ^ "52 killed in blast in Pakistani shrine". This page was last edited on 15 December 2018, at 11:24 (UTC).